Banana Cutlets | Simple and Delicious ! Tired of making unnakkai? 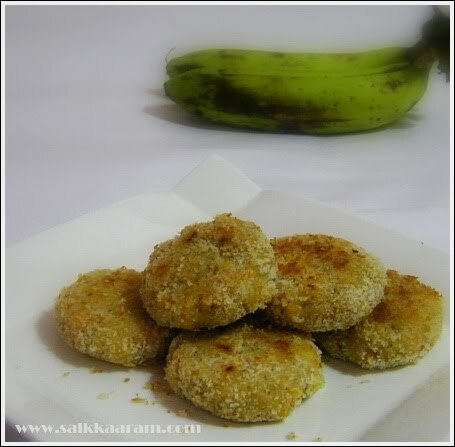 Then banana cutlets would be a best choice for you. Very healthy option. You don't need too much oil or ghee and no need to deep fry. My sis introduced me this , I think she got it from some magazines or Tv cookery shows. Ripe bananas (nenthrapazham) should be used for making this, not the green one like robesta or chiquita. Don't get confused of the banana used in the picture... :) Also try using the ghee roasted coconut and nuts as we prepare unnakkai.. Allow to cool and peel. Add grated coconut and cardamom powder to this. Mix well and make cutlet shapes. Roll over in the bread crumbs. No need to pour oil for shallow frying. 1 tsp of oil will be enough for each batch. Place each cutlet on frying pan, flip over when one side is slightly golden colored. 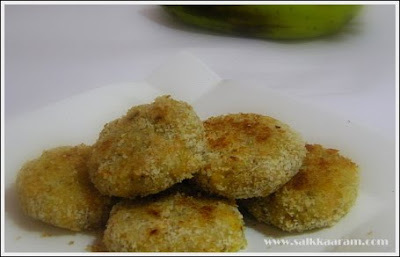 I have never had cutlets with banana looks really yumm. I can imagine the taste and arome, looks so good. Love the ripe bananas. This sounds new to me. Nice recipe. Looks so good.YUM!!!! This is a new way of serving banana to me! Very yummo!